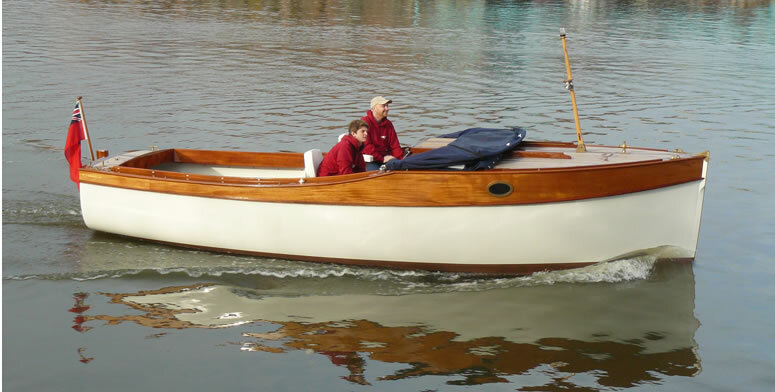 "equally well equipped to cope with rougher open waters as the genteel environments of the River Thames"
The Bristol 22 (main picture) is the exciting first example of the classical styled, wooden built Bristol range of Star Yachts. 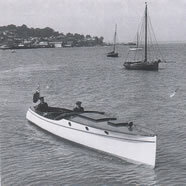 A boat suitable for going out for a picnic or a fishing trip, exploring your surroundings on a long weekend, and entertaining six in the cockpit. 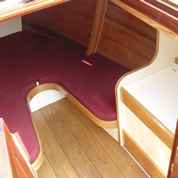 The layout of the boat provides for overnight or short holiday accommodation in the forward cuddy under the raised deck, with two berths forward that can be converted to a double v-berth, a small but well equipped galley with gas or parafin stove, sink and waterpump, and a porta-potti hidden under the bench. Apart from the helmsman's and passenger seat, there is ample room for six in the comfortably fitted out cockpit, an area that can be converted to another double bunk. Together with the fold-up canopy the whole cockpit can be changed to a weather protected and private area with full standing headroom. 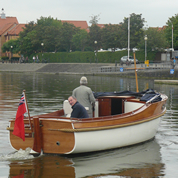 Based on a cross between a 1920’s Gentleman’s launch and a more sturdy Harbour launch, well known marine architect Andrew Wolstenholme created for us a design that is equally well equipped to cope with rougher open waters as the genteel environments of the River Thames. Her narrow easily driven hull makes for an excellent smooth and economical drive, needing only a relatively small engine. If you are planning on river or canal use only, then her shape is ideally suited for an all electric version. A new development is the hybrid propulsion where diesel and electric motor are put in line, either the one or the other can be used, depending on the power requirement or the state of the batteries. However, most people will choose the economical diesel version for its versatility. 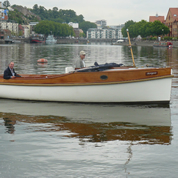 The Bristol 22 might look classic but the strip plank building method has all the advantages modern materials can give us, without losing the sound and look of a properly built wooden boat. The epoxy resin and glass fibre sheathing encapsulates the timber hull, making it very strong, stable, well protected and suitable for finishing with long lasting modern finishes. This means that contrary to traditionally built wooden boats the boat can be kept equally well out of the water on a trailer, and brought to any stretch of water that takes your fancy. Star Yachts is a small company and all boats are hand built to order. This means that although the Bristol 22 is offered as a 'Utility' and a 'Classic' version for its kind of finish and level of fit out, this is only a guidance: we are set up to build to every customers specific requirements and regard the ordering stage a vital instrument in finding out together what they are. 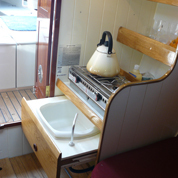 The ‘Classic’ version uses a lot of varnished hardwoods in the cockpit, has teak decks and cockpit floor boards, sports a fully kitted out galley, extendable bunks, etc. 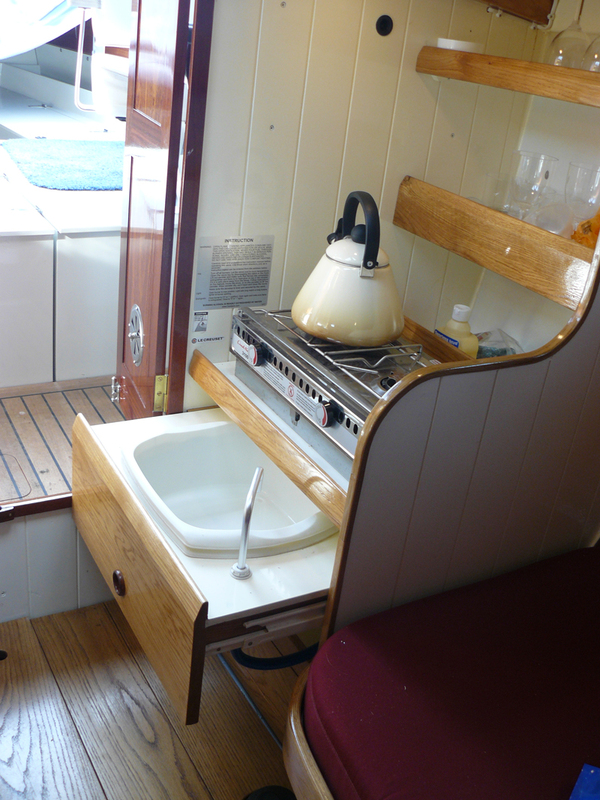 whereas the ‘Utility’ has mostly a painted finish, two fixed bunks and a worktop and cupboards and simpler helmsman seats. With its easily driven hull the Bristol 22 is an excellent candidate for electric drive and is able to run all day on its batteries. Another advantage is the small size of the motor, freeing up the cockpit space for different seat configurations.